To the surprise of almost nobody after leaked news yesterday, drone manufacturer DJI announced the Mavic Air this morning, a new $799 (base price) consumer/light pro quadcopter that packs most of the features of the Mavic Pro into a smaller, lighter and less expensive package. A "Fly More" package with 2 extra batteries, extra props and more will run $999. The specs are pretty much what we heard about yesterday and are quite impressive in terms of their similarity to the Mavic Pro. The Air comes with a 3-axis mechanical gimbal with an angular vibration range of just 0.005°. Gimbal dampeners were added for even less vibration. The video capability is pretty impressive: 4K 30fps (that's different from the 60fps expected), but recording at 100 Mbps for best quality. The Air uses the familiar 1/2.3-inch 12 megapixel CMOS sensor and an F2.8 lens. For professional quality, you'll still want to move in the direction of the Phantom 4 Pro with its 1-inch, 20 MP CMOS sensor and mechanical shutter. As with most of the newer DJI quads, the Mavic Air is compatible with DJI Goggles for FPV flying. One unexpected delight is the addition of a 120fps 1080p slow-motion video format and new HDR algorithms build into the drone. There's now 8GB of internal storage in addition to the Micro SD card slot. Any drone pilots familiar with the Spark radio controller will find the display-free Mavic Air controller to be very familiar. Max flight time is 21 minutes, and the Air has a top speed of 68.4 kph (42.5 mph). Th controller uses dual bands to provide a 720p live view up to 4 km (2.4 miles) away. One thing I really like about the Mavic Air controller is the removable control sticks that are stored in the RC. DJI has always mimicked Apple in terms of its packaging and presentations; the following video even uses a Jony Ive-like narrator for a look at the design of the new drone. 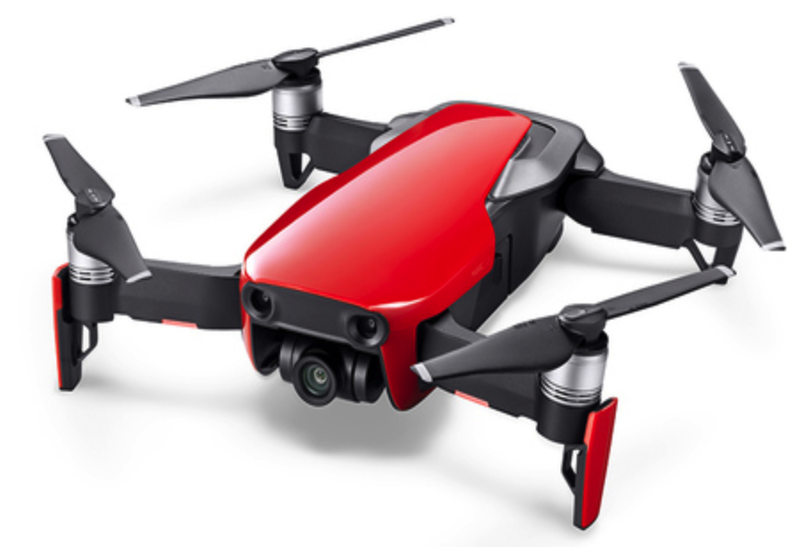 Weight of the Mavic Air is 430 grams (0.95 lb) compared to 734 grams (1.62 lb) for the Mavic Pro Platinum -- during the DJI event, it was noted that the new, sleeker design is much less susceptible to wind drift than the Mavic Pro. So who is the Mavic Air for? Well, judging from sales of the Spark, it's obvious that DJI realizes that the money is to be made in the consumer market, not the pro market. The Mavic Air sits right between the Spark and the Mavic Pro in the market, and other than providing the user with 9 more minutes of flight time, I'm not sure why anyone would now choose the Mavic Pro over the less-expensive Mavic Air. Full specifications for the Mavic Air can be viewed on the DJI site. The company says that the Mavic Air will ship on January 28, 2018. Oh...one more thing: it comes in Arctic White, Onyx Black and Flame Red. This post was previously published on our sister site, Drone World Today.